We did a little bit of cash flow analysis in the last chapter. In this one, we look at the cash flow ratios that SharePad calculates for you and what they can tell you about a company’s financial performance. This chapter will be quite detailed but hopefully after you’ve read it you’ll be well on the way to becoming a better investor. As with balance sheets and income statements we turn the numbers from them into useful information by calculating ratios. SharePad calculates lots of cash flow ratios for you. Tesco’s main cash flow ratios are shown in the table below. One thing that you will notice is there are lots of ratios based on what is known as free cash flow. I’ll explain more about this shortly but in simple terms it is the amount of spare cash a company has left over after it has paid all its essential costs. This will include items such as wages, interest, tax and spending on new assets to replace old ones and to expand the business. What’s left over the company is “free” to do with it whatever it pleases. It might use it to pay dividends, buy back shares, buy new businesses, pay off some debts or simply retain it. For many, free cash flow is what investing is all about. Unlike profits, which can be manipulated by a stroke of a pen (such as changing a depreciation policy for example), free cash flow is much harder to manipulate. A company can’t pay bills and dividends with profits. It needs to generate cash. It is often argued that the value of any business is the amount of free cash flow that can be taken out of it for the rest of its life expressed in today’s money. That’s why investors spend a lot of time looking at free cash flow and estimating what it will be in the future. This is impossible to predict with any real accuracy for most business, but that doesn’t mean that free cash flow isn’t a very important measure of company performance. It’s something that you should pay very close attention to. In SharePad, we use the terms FCF and FCFf so I’ll use these terms for the rest of this chapter..
For Tesco in 2014, this figure was £800 million (4316-635-2881). This is the amount of money available to pay all providers of finance in a business – interest on debt and dividends to shareholders. It’s normal to expect a company’s free cash flow to move around from year to year. This is mainly due to the fact that investment in the business (capex) tends to be a bit lumpy depending on the company’s plans for expansion and how many existing assets need replacing. 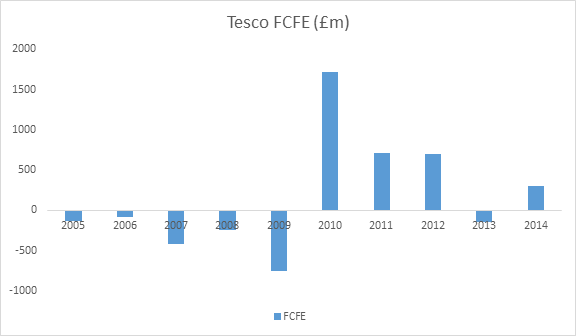 In Tesco’s case, the decline in its FCFf looks to be almost entirely attributable to its fall in profits – not a good sign. Hang on a minute. You are probably interested in buying the shares (the equity) of a company. Why on earth don’t we just look at free cash flow to equity (FCF) instead? We will in a minute. But FCFf is very useful too. That’s because it ignores the way a company is financed as interest paid on debts is not deducted. This makes FCFf a good measure for comparing different companies with different mixes of debt and equity finance. It shows you the surplus cash generated by the business as a whole. I bang on about gearing and debt a lot in this book. Not only is it a key risk to shareholders if there is too much of it (see Chapter 4 for more on this) but it has the potential to confuse investors and think that something may be better or cheaper than it really is. I’ll say more on this later on too. This is a number that good professional investors spend a lot of time looking at. As I say above, it’s the amount of cash left over after a company has paid the interest on borrowings, taxes, capital expenditure and preferred shareholders (who get paid before ordinary shareholders do). It’s the cash that is ultimately needed to pay you a dividend on your shares. Tesco’s FCF in 2014 was £304m (4,316 – 496 – 635- 2,881). 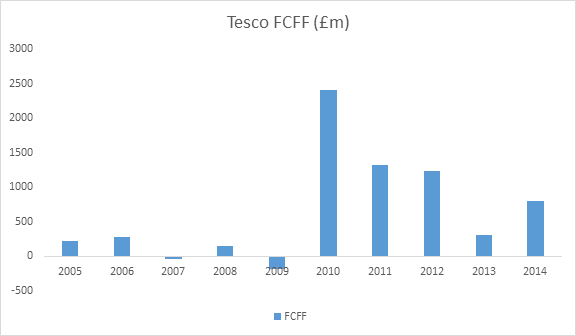 As with FCFf, Tesco’s FCF has been on a downwards trend. This confirms the trend shown when we looked at the company’s FCFf – falling profits are leading to falling free cash flow. The only difference between the two figures is that we take away interest payments to get to FCF. These are nearly £200m lower in 2014 than they were in 2014 and yet Tesco’s FCF is very low considering that it generated £4.3bn of cash flow from trading (operating cash flow). If you use the same definition of free cash flow then it should give you the same number regardless of its accounts. That’s the beauty of looking at cash. It’s either there or it isn’t. That said, the way US companies present their cash flow statements does complicate matters a little bit. Companies don’t always disclose the cash amounts of interest and tax paid. This doesn’t affect the calculation of FCF but does create an issue when calculating FCFf. Calculating FCF is not a problem. That’s because net cash flow from operations is stated after the deduction of interest and tax paid. To get FCFf we just add back interest paid to FCF. This is done automatically in SharePad. Hopefully you will understand a bit more about what free cash flow actually is in practice. The real use of free cash flow to an investor comes from when they use the numbers to dig deep into the company’s finances. All the numbers you need to do this are already calculated for you in SharePad. It’s a lot harder today for companies to fudge their profits than it was twenty years ago. Accounting standards are arguably tougher than they were. Yet, Tesco itself – as it admitted that it had overstated its profits in 2014 – is proof that sometimes profits are not always what they seem to be. As an outside investor you will never really know how a company’s profit figures are arrived at but there are numbers that you can crunch to give you some idea if all is well – or not. This is where cash flow in general and free cash flow in particular comes in. Free cash conversion – comparing free cash flow to equity with normalised post tax profits. Or free cash flow per share with normalised earnings per share. This looks at how effective a company is as turning its operating profits into operating cash flow. For companies with lots of tangible fixed assets (and therefore lots of depreciation to add back) you would expect the cash conversion to be over 100%. If a company’s operating cash flow is regularly below 100% – due to working capital outflows – this might be a warning sign and could be grounds for not investing in it. 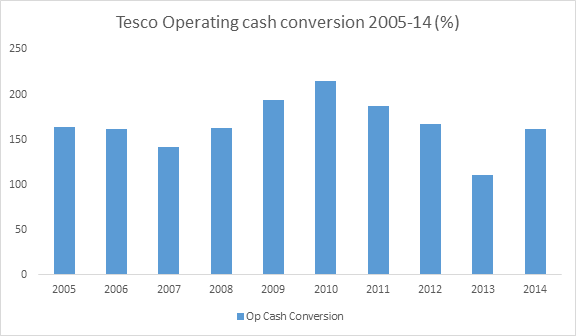 Tesco has been very good at turning its operating profits into operating cash flow as shown in the chart below. I’ve decided to look at this measure over ten years to get more of a feel of Tesco’s past performance on this measure. This is a really important ratio that SharePad calculates. It compares a company’s normalised earnings per share (EPS) figure – something people pay a lot of attention to – with its free cash flow per share – something people ought to pay a lot more attention to but often don’t. A hallmark of a company with very high quality profits is when a large chunk of its earnings per share turns into free cash flow. Let’s see how Tesco stacks up on this crucial measure. Not very well is the short answer. 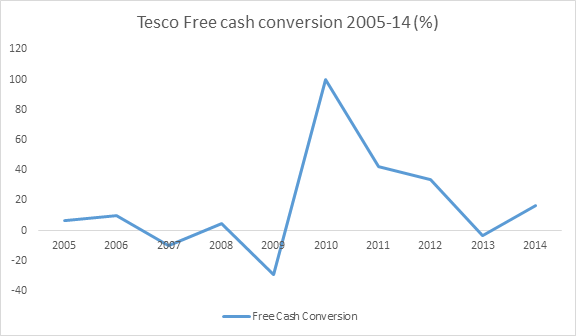 Tesco has only converted its normalised earnings per share into free cash flow per share once in the last ten years. I’ll show you the main reason why shortly. This is not a good sign for any business and is a definite warning sign that something might be wrong. However, it is important to point out that negative free cash flow is not necessarily a bad thing. In fact it can be a very positive sign about a company’s future prospects. If the money invested by the company today (which reduces free cash flow) leads to higher cash flows in the future than that is a good thing. That’s why you have to look at a company’s free cash flow performance over a number of years not just in isolation. If negative free cash flow seems to occur every year then that might be something to worry about. Contrast Tesco’s track record with that of the pub company JD Wetherspoon which has a fantastic long-term track record of turning its EPS into free cash flow as shown below. The company has a reputation for being very conservative with its accounting. Some might say its profits are understated. Which business would you rather own? 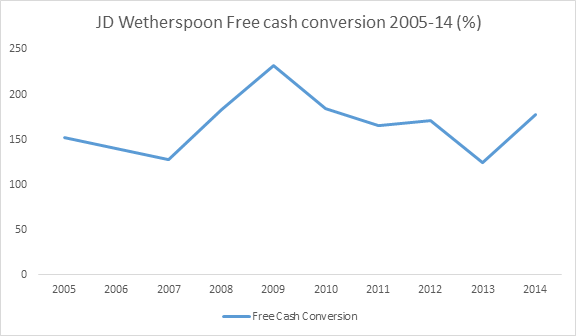 Could the superior free cash flow of JD Wetherspoon be one of the reasons why it has trounced Tesco as an investment during the last ten years? A company needs spare cash to pay dividends. If it doesn’t have this then it may have to borrow money or sell assets to pay shareholders. This cannot go on forever and only usually delays the day of reckoning when the dividend has to be cut or scrapped completely. SharePad calculates free cash dividend cover by comparing free cash flow per share with the dividend per share. We already know that Tesco has only converted its EPS into free cash flow per share once during the last ten years. It should therefore come as no surprise that its dividend has only been covered once by free cash flow over the same time period. 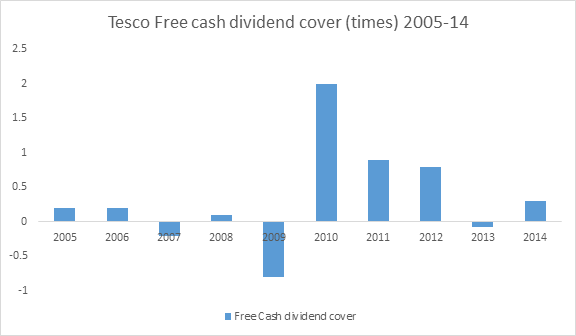 If you had been studying Tesco’s free cash flow performance then you probably wouldn’t have been too surprised that its dividend was scrapped in 2014 when profits fell again. The lesson here is that poor free cash flow eventually catches up with companies and their unfortunate shareholders. Apart from profits, and working capital the most important determinant of a company’s free cash flow is how much money it ploughs back into its business in buying new assets and replacing existing ones that have worn out. This is known as capital expenditure or capex for short. A company’s fixed assets can last for a long time but many of them don’t last forever. They have to be replaced if the company is to stay in business. If a company wants to grow and become bigger it may have to spend more money on assets. This causes cash to flow out of the business. Two of the key questions that you need to ask as an investor is: How much money does a company need to spend to stay in business? How much is it spending on expanding? Stay with me on this. It might get a bit complicated but hopefully it will all make sense in the end. When a company like Tesco buys an asset – such as fridges, display cabinets, shelving and ovens to bake bread – for its supermarkets, it has to depreciate them and charge this as an expense against its revenues which reduces profits. Depreciation can be seen as an estimate of how much you need to spend each year to replace your existing assets and keep them up to date. So when a company’s EPS is calculated it has had depreciation taken away as an expense. But remember, depreciation is not a cash expense. The cash flows out of the business when assets are purchased. We can see this in the cash flow statement with the capex number. This is the number that is deducted when we calculate free cash flow to equity (FCF). As you can see, Tesco has been spending huge amounts of money on new assets. 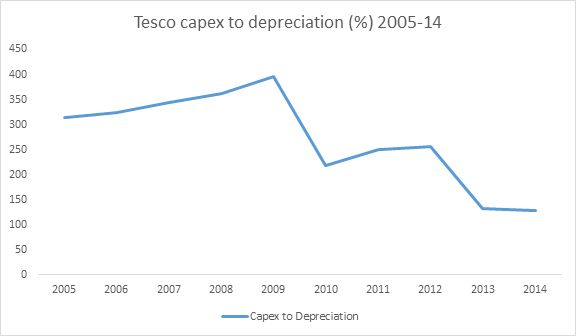 It peaked at nearly 400% of depreciation in 2009 and is the biggest reason why Tesco’s free cash flow performance has been so poor. The trouble for us, as outside investors is that we can’t really tell how much of the money spent is to replace existing assets (the cash equivalent of depreciation) and how much is spent on new assets. We do know that Tesco has been on a spending binge, opening lots of new supermarkets across the world. It has now cut back on capex but free cash flow has not improved much yet. The large amount of cash invested in new assets in the past doesn’t seem to have produced more cash flow later on. I’ll say more on this in the next chapter when we talk about financial returns. Capex greater than depreciation is not a bad thing as long as investors eventually see higher free cash flow in the future as a result. The other thing to watch out for is when capex is less than depreciation. This may mean that a company is generating lots of free cash flow. But it may also mean that it is not replacing its assets. If it does this for too many years then the business may start to deteriorate. Some investors add back the money received from selling assets when they calculate free cash flow. SharePad does not. It is not wrong to include the proceeds from selling assets in the calculation. In some businesses (such as car rental) there are meaningful asset sales made every year and it would be right to include these. SharePad is trying to be conservative. Asset sales for lots of businesses can be very irregular and may distort an investor’s view of a company’s ability to generate cash if they were included in the calculation of free cash flow. As well as comparing capex with depreciation, you can also compare it with the company’s sales or turnover. This is a measure of capex intensity – the percentage of sales it is ploughing back into the business. Look at this ratio over a long period of time so that you have a chance of spotting changes in a company’s business. If capex as a percentage of turnover is rising find out why. Is it because the company is expanding or is it because the cost of replacing assets has gone up? Compare this ratio with companies in the same line of business to see if capex levels are different. The beauty of SharePad is that it allows you to go back a long way and study a company’s finances. This can be very enlightening. 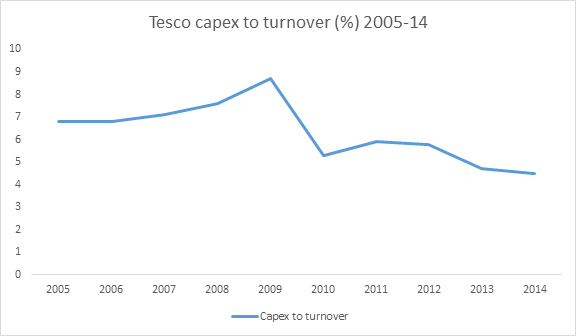 As you can see, Tesco was spending an increasing proportion of sales on capex during the second half of the last decade. It was actually spending more than its operating profits. With a poor subsequent cash flow performance, it looks like a lot of this money has been poorly spent. If you are comparing companies then looking at how much of their turnover they turn into free cash flow can be a good way of measuring a company’s financial performance. The bigger the percentage of turnover turned into free cash flow – the free cash flow margin – the better. 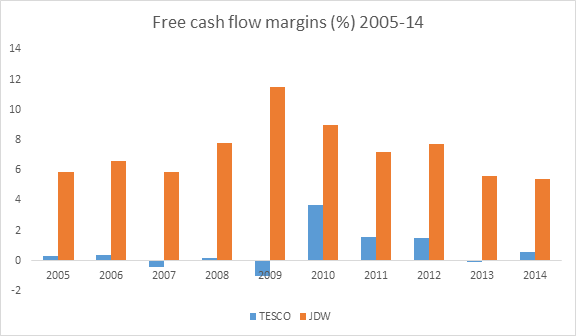 Again, this measure shows how poor Tesco’s free cash flow performance has been and how much better JD Wetherspoon has been. One thing to bear in mind with free cash flow margins using FCF is that they will be distorted by how a company finances itself. So if you have two identical companies but one has debt – and therefore pays interest – but the other is debt free they will have different free cash flow margins. We can use free cash flow to calculate other investment returns and to look at the valuation of a company. I’m going to leave that for another chapter.